"Binegadi" 4th Period Fauna and Flora Deposit is part of the Tentative list of Azerbaijan in order to qualify for inclusion in the World Heritage List. As for most Azeri TL, not much information is available about “Binagadi" 4th Period Fauna and Flora Deposit. 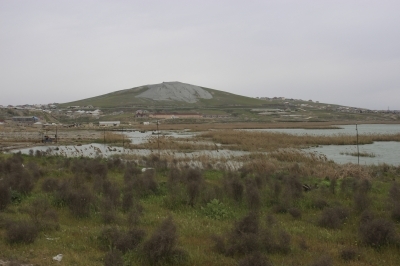 This site is a lake in the northern suburb of Baku, area of a tar pit (or asphalt lake), in which, for thousands years, animals and flora have been trapped in the tar. Deposits from the Pleistocene where found here covered by thick layer of a petroleum : some 50 000 bones of various animals, of which 40 specimen of mammals (wolf, hyena, bulls, bear and rhino), 120 species of birds (swan, crow, hawks, geese), 2 species of reptiles and one specimen of amphibians, as well as 107 species of insects and 22 species of vegetation relics have been recovered. Most of those remains are in display in the Baku Natural History Mueseum. Binagadi can be compared to Rancho-La-Brea Pitch in California. I visited this TL with a rental car from Baku, but it can be easily accessed by bus. The place is not signposted at all, and even after numerous research on the internet, I am not exactly sure of its exact location (the best I could find is the south-east corner of the Binagadi lake : approx. coordinates 40.467668, 49.801180). The lake can be seen from the road to Binagadi settlement (called 1st Madan on google maps) and approched in the west on a road to a stange building (with many security guards, so I did not stay long), or on the east from a dirt road. In the backdrops is a mud volcano. The area is not of any interest, and the tar pit can only be guessed from far. The view on the lake and the mud volcano is nice however, but not really worth the effort to get there.